Filing warranty claims and customer orders. Several manufacturers accept direct electronic claim filing via MMIR. Electronic submission of SDRs directly to FAA. Just fill in the blanks and hit Submit. MMIR Full Access is appropriate for operators, repair stations, and certified technicians who file warranty claims, service difficulty reports, and mechanical interruption summaries; or for anyone who simply wants to keep track of maintenance on their aircraft. Full Access MMIR reduces workload tremendously. SDRs and MISs are automatically forwarded to the FAA; there is no redundant paperwork or mailing involved. The MMIR form is accepted by most manufacturers for warranty claim purposes. For those manufacturers that require paper forms, MMIR lets you print your warranty claims. You can use MMIR as an internal maintenance tracking program. Simply select the "Internal Use" option before submitting the report. The report will be stored exclusively in the MMIR server, with no external processing (i.e., not forwarded to FAA or manufacturer, and not accessible to other parties). Of course, you can review and amend the report, and formally submit it later if appropriate. MMIR is a free program. Full Access gives you all the report-search capabilities available with MMIR Read Access , but with the capability to submit information as well. MMIR Full Access lets you add additional users to your account; i.e., employees who can create, edit, and view company MMIR reports using their unique log-on password. MMIR tracks who does what, so accountability is maintained. MMIR Full Access users also have the option to subscribe to HeliStat, a value-added service that provides advanced statistical analysis of MMIR data. HeliStat can red-flag potential problems, track individual aircraft, and produce trend analysis and graphic summaries. HeliStat is available on a paid-subscription basis. Find out more about registering for MMIR Full Access. From this menu, you navigate the entire MMIR system; creating new reports, searching and viewing old reports, editing or finishing incomplete reports, adjusting your aircraft fleet and engine inventory. Starting at the top left of the screen above, MMIR indicates your log-in name and Account Administrator for your company. The Account Administrator has authority to edit additional users, and amend their MMIR registration. Under "My Account," only the Account Administrator will have the "Edit Registration" and "Edit Users" links available. The "Fleet" and "Engines" links are available to all authorized users to amend fleet and engine information. Continuing down the left side, the Address Book link is available to all users. Next are the links to this User Manual, and a link to the User Agreement you agreed to when you initially registered. The E-form is a way to contact the MMIR program managers at HAI with a short question or comment. We welcome calls as well. 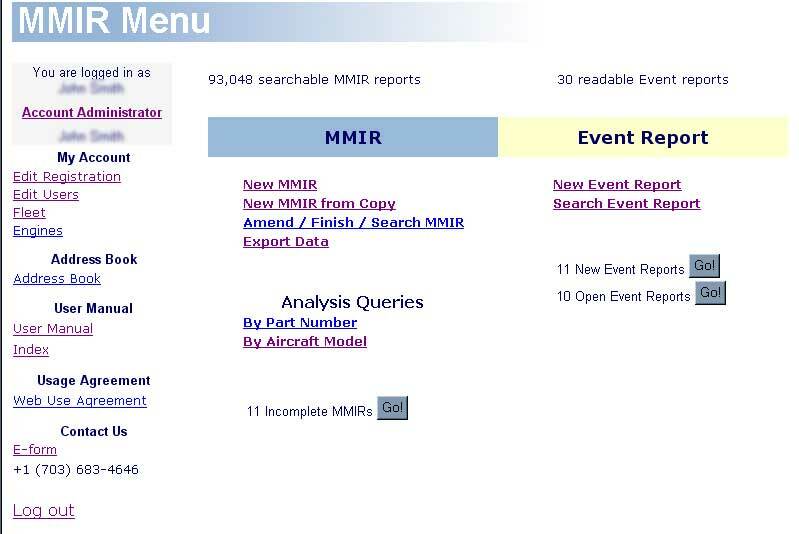 In the top center of the screen, the number of searchable MMIR reports for analysis purposes is displayed and updated each time you log onto the MMIR system. 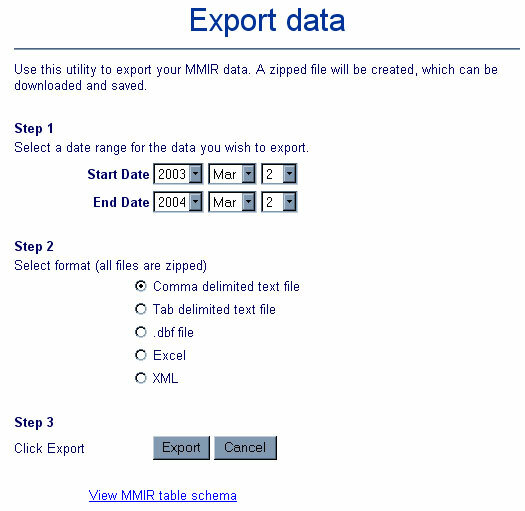 New MMIR To create a MMIR report from a blank form, click on this link. A new screen will appear with a pull-down menu, allowing you to choose the type of report you want to create. New MMIR from Copy This is a real time-saving option. Often you will have several reports (warranty claims, SDRs) to file that are very similar. Instead of starting each report from a blank form (New MMIR option), wouldn't it be great if you could simply use an existing form and simply change a few of the applicable fields? It's easy. Amend/Finish/Search MMIR MMIR saves your reports to a secure database. At some point, you will probably want to look at them again, perhaps to finish incomplete reports, add information, or simply do a review. Whatever your reason, your reports are available anytime. MMIR's comprehensive search engine is ready and waiting. It's a simple step-by-step process. After clicking the "Export" button, you will be provided a link to download the zipped data file. Save the zipped file to your local directory. Analysis Queries Parts analysis reports and model analysis reports are available.